Fall River Car Owners: Why Do Batteries Die in the Winter? There is nothing more frustrating than running through snow and ice to get to your car or truck, just to experience a dead battery. Anyone who owns a vehicle has gone through this at one time or another, but it does seem to happen more during the winter months than any other time of year. One way to prevent this from happening is to stay on top of your battery with free battery testing in Fall River at LaCava Auto Parts. In addition to battery testing, we also provide a variety of other services, including rotor turning services to help you save money on your next brake repair and hydraulic hose services. The best way to understand why car batteries tend to die more in the winter than they do other times of the year, is to learn a little bit about how a car battery works. 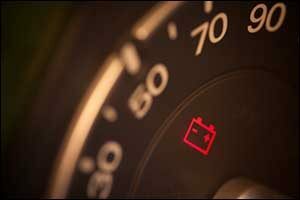 The most common type of car batteries are lead acid batteries. They are inexpensive and more dependable than other types of batteries. A plastic housing is used to encase the battery, which is made up of lead plates that are immersed in an electrolyte pool that is made up of a mixture that includes sulfuric acid and water. There are two plates in each cell of the battery and each completely charged cell produces 2.1 volts. Six cells are contained inside of a 12-volt battery. The battery itself receives and stores a charge through a chemical reaction that is made between the electrolyte and the lead plates inside each cell. The battery itself does not produce a charge. The positive and negative plates are coated with lead sulfate as the chemical reaction of the electrolyte occurs in a process known as sulfation. Unfortunately, this will reduce the ability of the battery to hold a full charge over time. Also at work against the lead acid battery is the natural self-discharge of energy over time. If the battery isn’t charged regularly, it will eventually discharge over time. Temperature can really affect the rate of discharge in a lead acid battery. The extreme heat of the summer and the extreme cold of winter are the most damaging to your battery. During the summer, the heat works to evaporate the water within the electrolyte, which increases the sulfation, reducing the battery’s ability to hold a full charge. During the winter, the freezing temperatures work to slow down the chemical reactions that occur within the lead acid battery, hindering the ability of the battery to perform to its full capacity. Another problem that occurs in the winter is that a cold engine demands more power from the battery than it does during more temperate months of the year. Additionally, warming features used by drivers in the winter, such as the heater and defrost, put more strain on your battery as well. On average, your lead acid battery should last you about four years. However, under extreme conditions, such as the ones experienced right here in Southeastern Massachusetts, they may not last as long. Your best bet is to get free battery testing in Fall River at LaCava Auto Parts to ensure that everything is in good working order. In addition to getting professional and courtesy services on a regular basis, such as free battery testing in Fall River, it pays to learn all you can about signs to watch for regarding a low or failing battery. Headlines that are dimming yellow instead of white, failure of various electronic accessories, battery warning light on the dashboard, dimming of dome lights, slow cranking engine, and an unusual sounding car horn. In addition, a smell that is like sulfur or rotten eggs can be an indication that you should get your battery checked out. If the case for the battery is cracked or swollen, this should also be a cause for worry. Batteries that are more than three years old should definitely be checked prior to the onset of cold weather. Other essential features on your vehicle should be checked as well, including your brakes. When cold weather hits, snow and ice can’t be too far behind, so it pays to get your tires and brakes checked before it hits. LaCava Auto Parts offers rotor turning services, which can help to extend the life of your rotors when you change your brake pads, if they aren’t worn down too much already. For vehicles and equipment that rely on hydraulics, our hydraulic hose services are available 7-days a week to help you get back to work. If you live or work in the Greater Fall River area, check out the opportunities available at LaCava Auto Parts. We offer a wide range of free and paid services, including free windshield wiper installation with purchase, professional rotor turning services, commercial hydraulic hose services, and free battery testing in Fall River. Give us a call at 508-676-1951 or stop by our location on Bedford Street in Fall River, Massachusetts. 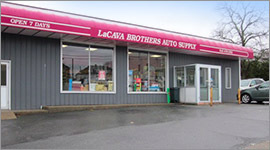 LaCava Brothers Auto Supply has served the South Coast region for over 70 years, providing a wide selection of car parts, accessories, tools and services to car owners and professional auto industry businesses.